Search "Singer & Nicholson Co." , They made anvils back in the mid-1800s in Pittsburgh, PA at Sheffield Steel Works. MCB, Your anvil is in fact not English made but rather American made...Very neat piece! Very interesting that the "100" is on the foot, same as Fisher. I have a 40, 50, 60, 70, 80, 150 LB "6-Point Star", none of which have the weight on the foot, only under the horn. Gives more credence to Fisher producing the anvils. I managed to pick this up on a recent trip to Iran. It is manufactured by the Iran Potk Company which has been in business since 1984. 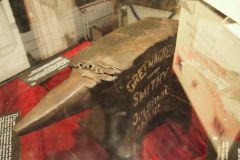 They make a wide variety of tools, including this miniature anvil, and a full size 24kg (53lb) and 50kg (110lb) anvil. All look very similar to the Ridgid Peddinghaus style anvils. Didn't get to try one out but appear to be good quality. The mfg. lists them as cast carbon steel w/ a hardened face. Traded For Anvil Today, Not Sure What The Maker's Mark Is. Calling any and all anvil pros. Another anvil I.D. All, This is a SAMSON. You can typically tell a SAMSON by the position of the pritchel hole being behind the hardy hole instead of offset like 99% of anvils. 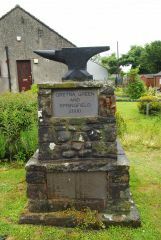 H & I FORGEWORKS, Although it says WOO towards the bottom of the anvil, the placement of the stamp and the feet style do not look correct, I do not believe this is an ATTWOOD. 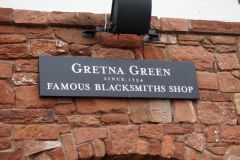 There also appears to be the name ????? ?KERS above it. I have found that a lot of anvils up in Canada and Australia have either the exporter merchant name (England), or importer merchant name (Canada) stamped into it rather than the manufacturer (thus why it is in LBS and not Stone Weight). Is there any stampings above it? 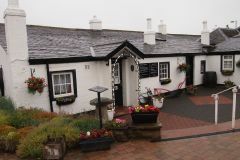 As Thomas mentioned, it is right across the border of England. It is nothing more then a tourist trap nowadays, complete with a tour bus of Japanese. 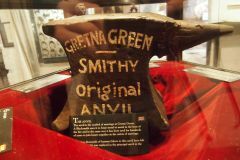 There are several other old English anvils in the 250lb range painted with the Gretna Green words in each of the rooms, a couple of old carriages and time period items. I believe the tour to see the original anvil was around $10 USD.